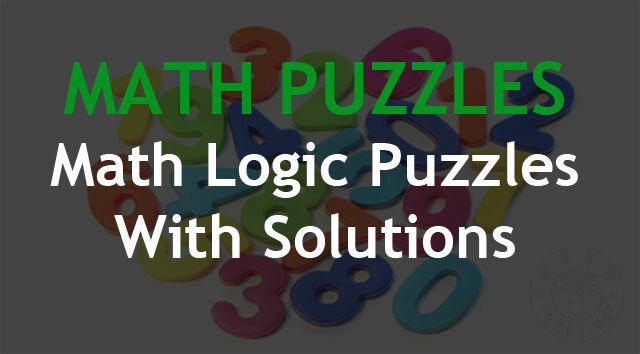 If you like math and you love math logic puzzles then you’ve come to the right place as we have the best math logic puzzles. Here is your chance to pit your brain against some of the world’s hardest math logic puzzles ever created. Most of the math puzzles are repeated in a number of webpages--with or without various, which makes it difficult to credit a particular Internet source. Instead, we thank all Internet collectors of math logic puzzles. So here’s our favorite math logic puzzles. Bob brings home 100 lbs of potatoes, which (being purely mathematical potatoes) consist of 99 percent water. He then leaves them outside overnight so that they consist of 98 percent water. What is their new weight? The new weight is 50 lbs. If 99% of 100 lbs is water, then the non-water component weights 1 lb. The next day they have dried out, so 98% is water, 2% is non-water. If the 2% weights 1 lb then the whole lot weights 50 lbs. A census worker asked a mother for the ages (years, not months) of her three children. The mother replied that the product of their ages is 36, and the sum of their ages is the same as the address (house number) to the north. After looking at that adress, the census worker returned and said to the mother:"I need more information." The mother said: " The oldest is sleeping upstairs." What are the agaes of the three children? What is the address (house number) next door to the north? The reason the census taker could not figure out the children's ages is because, even with knowing the number on the house next door, there were still two possibilities. The only way that the product could be 36 and still leave two possibilities is if the sum equals 13. These possibilities being 9, 2 and 2 and 6, 6 and 1. When the home owner stated that her "Oldest" child is sleeping she was giving ths census taker the fact that there is an "oldest." The children's ages are therefore 9,2 and 2. How to solve the width of the river without crossing it? if you only have a big protractor and a meter stick? Trig if you have line of site. Look at a tree or rock exactly across, then parallel the river with your meter stick then determine the angle from your new point to the rock/tree. Tangent of angle = width of river over the length traveled paralleling the river. Three ladies went to a tv shop and bought a tv for £30 from a salesman. each one payed £10 each. boss says give £5 back. salesman puts £2 in his pocket and give £1 each back to the ladies. women have payed £9 each now, £9 £18 £27. salesman have put £2 in his pocket £29. Where is the other £1? You are adding what the ladies paid as actual money. They now are down 9 each - for a total of -27. Add to this the 2 in the salesman's pocket, and you have -25 which balances out with what is in the bosses pocket. The problem here is that you are adding positive amounts to negative amounts and ignoring the sign. You have 20 Blue balls and 10 Red balls in a bag. You put your hand in the bag and take off two at a time. If they’re of the same color, you add a Blue ball to the bag. If they’re of different colors, you add a Red ball to the bag. What will be the color of the last ball left in the bag? You are on your way to visit your Grandma, who lives at the end of the valley. It’s her anniversary, and you want to give her the cakes you’ve made. Between your house and her house, you have to cross 5 bridges, and as it goes in the land of make believe, there is a troll under every bridge! Each troll, quite rightly, insists that you pay a troll toll. Before you can cross their bridge, you have to give them half of the cakes you are carrying, but as they are kind trolls, they each give you back a single cake. How many cakes do you have to leave home with to make sure that you arrive at Grandma’s with exactly 2 cakes? Two trains are 2 miles apart and are traveling towards each other on the same track, each train going 30 mph. A fly going 60 mph starts at the nose of one train, flies toward the other train, and upon reaching the second train immediately turns around and flies back towards the first train. The fly buzzes back and forth until all three collide. How far did the fly fly? 0 Response to "7 Hardest Math Logic Puzzles With Solutions"